There's nothing in the natural world that comes close to the magic & brilliance of a Scottish salmon river during early Spring especially if you're on it 'tooled up' with enough tactful intelligence to be in with a fair shout of success. Take a deep breath of fresh Scottish Spring riverbank air and hold it in your lungs then cast your eyes out across the dark mysterious swirling salmon water of the mighty River Tay with that deep routed underlying suspicion of the presence of a 'highly prized' silver flanked power house is definitely one of the greatest natural feelings of all if you dare to venture into this perfect natural playground. Your kit has been carefully prepared and your riverbank movement is 'spot on' so you know it's only a matter of time before our 'Salmon God' tips you the wink! Understanding the educational qualities of the salmon game are important as a salmon river and the inevitable blank fishing days can both be daunting to an untrained mind. In an instant gratification society we are all trained to expect results quickly where we can even speed most results up with credit cards or cash. You cannot however buy a salmon into making it take your fly or lure so controlled patience is vital and even when you're fishing on the most prolific of Scottish salmon beats. Switching your mind and fishing approach into logical 'water coverage' mode will put you well ahead of the pack especially if that is paired with 'sub surface' lure or fly control thoughts. 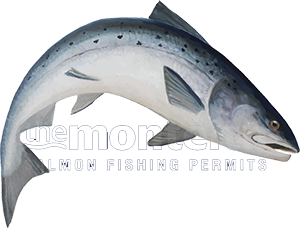 There's a great sense of excitement for any angler who's heading to a salmon river for the day and that same buzz is felt by all the professional Scottish ghillies too. It's important that you manage this natural energy carefully and don't burn out after the first hour or two because the fish you seek is playing hard to get! The key to this game is without doubt having the ability to keep your expectation levels low and your persistency levels high so 'drip feed' yourself that natural energy throughout the full course of the fishing day. Trying also to keep your mind in neutral expectation mode also works a treat as I'm 1000% convinced salmon can sense over eagerness and will shy away from it on every occasion. 9 times out of 10 a salmon take sneaks up on you when you're 'defocussed' so think about what I've just said for a moment or two before reading on. When you're out on the river your part of the deal is to 'effectively' cover as much water as you can in both the morning & afternoon fishing sessions. Don't stay in the one spot hoping a salmon is going to come to you or keep bombarding a salmon lie where you know fish are likely to be holding. If a salmon wants your fly or lure it will let you know about it fairly quickly so bombarding a particular salmon lie is more often than not counter productive as you're only training salmon to accept the presence of your lure or fly in the stream. The most effective way I've personally found to make a salmon take is to 'startle' it by not showing too much of the fly or lure via properly spaced water coverage which will often 'trigger' its oceanic hunting instinct rather than try to bore a fish to death hoping it'll eventually change its mind! If a salmon only briefly sees a fly or lure it has to make a snap decision whether or not to commit to a full investigation and we all know what curiosity did to the cat! Whatever pools you're allocated by the Head Ghillie on arrival at a salmon beat switch into Google Earth 'Satellite' mode. What I mean by this is take that aerial snapshot in your mind and make your objective to fill that entire river map in with precision sweeps with your fly or lure that are all identically spaced by about 3 or 4 feet. When it comes to lunchtime or 5pm you'll have covered not just the 'hot spots' properly but all the rest of the water too. This is the logical approach to Scottish salmon fishing that is completely missed by the majority of Scottish salmon fishers who give effective water coverage zero thought or they've never been effectively shown. On the River Tay the boat scores highly on any salmon beat that possesses a skilled boatman primarily due to this 'effective' water coverage principle. If you adopt the above logical water coverage theme and add into this a careful presentation thought process of intentionally trying to achieve the correct 'depth & speed' of your fly or lure to match the seasonal water conditions and temperatures you'll then have transformed yourself into a absolute salmon fishing machine! By adding this additional thought process & skill set to your salmon fishing approach you'll also have added yourself into the top 5% bracket of Scottish salmon fishers. Once you've properly mastered both of these above important salmon fishing skills you'll start to take just as much satisfaction from the effective water coverage you're deploying as you'll do from the 'inevitable' salmon you'll catch!